From top left - first 2 images: Icefire – 50ft Cruiser-racer. 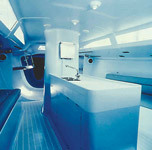 middle image: Pinta – Performance cruiser. Client, Michael Ilbruck, Germany. 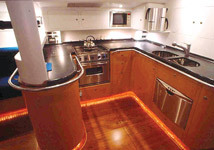 Galley area; last 2 images: Te Ariki Nui – 55ft Big game fishing boat. Client, Bill Hall. 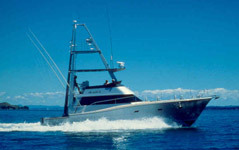 Tuna tower, exterior styling and interior design in collaboration with Bruce Woods. left: Hull graphics on America’s Cup challenger New Zealand in San Diego 1993. Large white lettering reflected on the water hindering aerial photography of the keel design.